Vegan Holiday Dazzle Spread – 12 Days of Holiday Snacking! 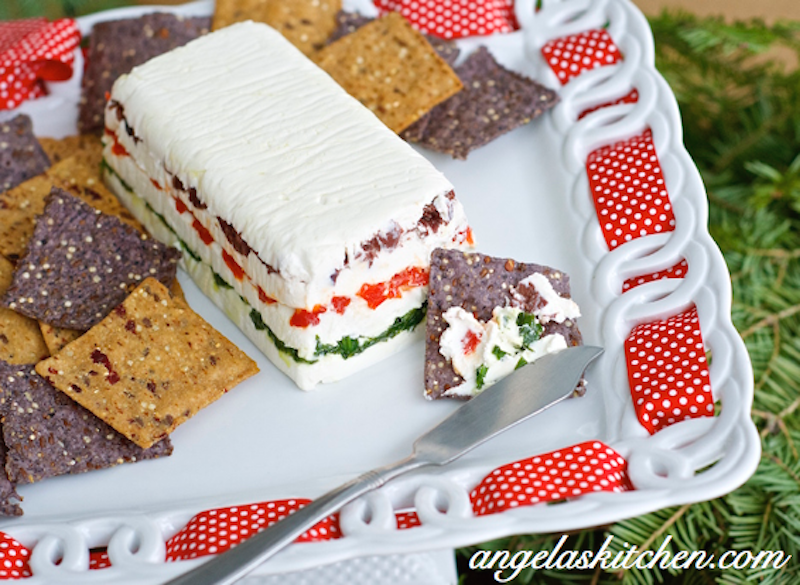 A creamy dairy free spread layered with olives, roasted red peppers and spinach for festive flair. Every year our family bundles up and heads downtown for the Hollidazzle parade before going the 8th Floor Macy’s Holiday Display and take picture with Santa. Yep, even as my kids have gotten bigger (and my son is now 19 years old and 6′ 3″ tall) they still troop on in to get a picture with Santa for their mom. Best kids ever! Last year was the last year for Hollidazzle parade, changing to this year’s Hollidazzle Village. Messing with holiday traditions can be a tricky thing, but we need to leave room for traditions to grow and change while keeping the core of why it was important to your family. 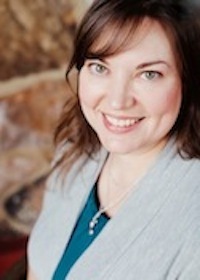 The most common question I receive from families newly diagnosed with food allergies is how to manage the holidays. We all have food traditions strongly tied to our holiday memories and want to preserve them for our children and ourselves. When food allergies or celiac enter the picture, holidays can seem like an overwhelming obstacle instead of a chance to rest and renew with our family. My suggestion? Make a dinner you know everyone already enjoys, and isn’t too difficult to make that satisfies your allergy restrictions. Then, ask you family (our yourself) what is the one dish that would help make it feel like Christmas. Make that one thing and have the whole family pitch in to help. Every year, just adapt one recipe as you choose to, but don’t sweat it if it doesn’t turn out exactly as you planned. You may just create a new tradition of your own! For my family, Swedish Rye Bread was what was requested, and honestly, the first year my gluten free yeasted breads were VERY odd. I should have gone with a more forgiving muffin with similar spices, but I was stubborn determined. Never mind that all my yeasted gluten free breads where lopsided… That Christmas just the smell of the spices and the parts we were able to nibble (around the sunk in center) were delicious simply because we tried to make it together. And, boy, did my son (who was 6 at the time) laugh and laugh at the funny looking bread. 🙂 That is a Christmas memory I cherish. Not the oddly shaped bread, but the time we took to try to make it together and the laughter we shared when it didn’t go as we planned. Now when I grind the spices for gluten free Swedish “Rye” Bread I remember that first gluten free Christmas and the lesson on not taking myself or the food at the table too seriously. It is the company that matters – that we are together, and safe with plenty of food that will nourish, even if it is lopsided. What are the holiday traditions that make things special for your family? This holiday season, 11 other bloggers and I are participating in the 12 Days of Holiday Snacking with Way Better Snacks! I can’t wait to see what everyone else comes up with to pair with Way Better’s fabulous chips. Gotta love their non-GMO, sprouted crispy tastiness. They best part for our family is all of the tortilla chips are gluten free. Check out the Way Better Snacks Pinterest board over the next few weeks as more snacks are added and give the other bloggers some love. The recipe links will also be at the Way Better Snacks Facebook page, so definitely keep an eye out for those. 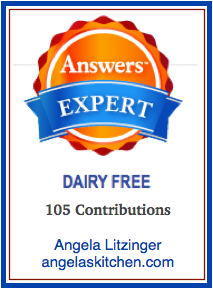 This holiday season, try my simple to put together dairy free spread that will compete with any dairy filled cheese ball. The colorful layers give it delicious flavor while looking festive. The best part? This spread is easy-peasy to put together and it can be made up to 5 days before your need it. If you don’t want to take the time to allow the spread to set up or want to layer it, simply scoop the blended cashew mixture into a bowl and stir in the olives, peppers and spinach. We like to serve our dips with sprouted and tasty Way Better Snacks to really make our dips feel like something special. We used the Punkin Cranberry (LOVE!) and the Unbeatable Blues with the spread and the spread was delish on both. To learn more about why sprouting is so important, and more about all the yummy flavors they carry, check out their website for more info: gowaybetter.com. Enjoy! A creamy dairy free spread with festive flair! Lightly oil a mini loaf pan. Line with plastic wrap or parchment paper, allowing the wrap to overhang the pan. You will use these "handles" to lift the spread from the pan after it has set. Lightly oil wrap or parchment. Set aside. In a small skillet, heat olive oil over medium-heat. Add spinach, garlic and basil to pan, sautéing until spinach has wilted. Season with salt and pepper to taste. Remove from heat and allow to cool until ready to use in recipe. In a Vitamix or other high-powered blender, blend soaked and drained cashews with lemon juice, agave or honey, coconut oil and apple cider vinegar. Add water one tablespoon at a time, as needed, to make a very smooth and thick spread texture. It should be similar to the texture of cream cheese. Add softened cream cheese substitute to cashew mixture and blend well until smooth. Taste and add salt, if needed. Create the layers: Divide the cashew mixture into 4 parts. Scoop 1/4 of the cashew mixture into the prepared mini-loaf pan, smoothing into an even layer. Mix olives and thyme together. Spread olives evenly onto cashew mixture. Scoop another 1/4 carefully onto of the olive layer and smooth. Spread peppers evenly onto cashew mixture. Add another 1/4 of the cashew mixture on top of pepper layer. Smooth cashew mixture. Spread spinach mixture evenly onto cashew layer. Add final 1/4 of cashew mixture to loaf pan and smooth. Wrap pan with plastic wrap and place in refrigerator until firm. Spread can be made 5 days before serving, covered and refrigerated. To serve, unwrap spread. Lift spread out of loaf pan using parchment or plastic wrap lining pan. Careful flip onto serving plate and remove parchment. Serve with your favorite Way Better Snacks and enjoy! 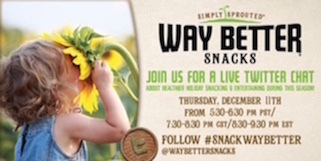 Join Way Better Snacks for their first ever Twitter Party this Thursday, December 11th, 7:30 p.m. CST (5:30 p.m PST/8:30 p.m. EST) all about healthy and delicious Holiday Snacking. Follow #snackwaybetter and @WayBetterSnacks to join in the fun! Learn more about Way Better Snacks! I created this recipe for Way Better Snacks, but was not compensated other than with delicious chips and payment to purchase the ingredients. It’s a delicious sprouted snack I buy and serve my own family (our favs are Sweet Potato, Black Bean, Punkin and Sweet Chili). Thank you for supporting the brands that I carefully choose to work with, that help make this site possible. All opinions are 100% my own. I love this, Angela! It's beautiful and looks very tasty. I think I'll be making it for a party tomorrow night! Hope you're having a wonderful holiday season!